This is a custom product we did a couple of months ago. Claude from NYC contacted us to see if we could make some buffers for him. That's one of those things that's just so simple, it never even occurred to us to offer it as a product. Claude told us that Black Cat Fred made some buffers for him many years ago, and now he wanted to get some more. 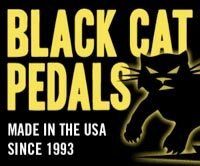 Looking through some old documentation, we discovered that Fred actually built a good number of buffer pedals during the heydays of the original Black Cat. We made a couple of different buffers for Claude. 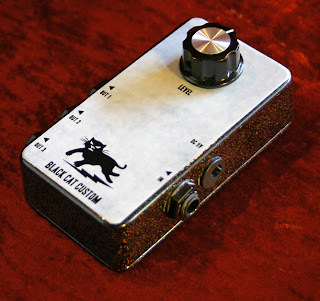 This one pictured here is a Black Cat Custom Buffer Boost. It has one input and three outputs, and the Level control can boost the signal up to 40 dBs. It's pretty snazzy looking too! Whaddaya think? Alright, I'm a moron. But what is a buffer and why does it have 3 outputs? Ohhh very nice!!! I want one!!! I play bass with the above mentioned Claude & that buffer is in use on at least one or more of his elaborate boards filled with a variety of vintage & newer overdrives, distortions, phasers, synths, etc. etc. Mennen Speed Stick Rant - UPDATE!